Dreadful Company builds on the strengths of the first volume in the series, delivering another solid urban fantasy adventure. Dreadful Company is the second novel from Vivian Shaw in the Dr Greta Helsing series, following last year's Strange Practice. Readers who follow a fair bit of fanfiction may have already come across Shaw's works in the Homestuck, the MCU and Star Wars fandoms as coldhope. This background puts Shaw in a strong position to bring some of the most interesting aspects of transformative fiction to this original series, which takes such venerable members of the vampire canon as Lord Ruthven and Varney the Vampyre, and effectively sets them in a modern AU, showcasing them in a new environment without needing to focus on their process of adaptation. As her surname indicates, Greta is a descendent of Abraham Van Helsing -- though the family dropped the "Van" a while back -- and she's inherited the family business, but it's not the one you'd think: instead, she runs a medical practice dealing with the problems of London's supernatural denizens. Greta has built a strong community with the undead of London, and most of the undead cast have happily established their niche in 21st century London, and are strongly invested in protecting it against those who threaten it in any way. 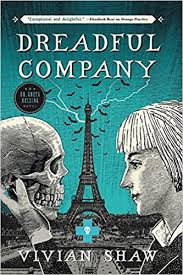 Dreadful Company picks up the narrative some time after the end of Strange Practice, with Greta and Ruthven on a visit to Paris as Greta prepares to present a paper at a supernatural medical conference. Before they get there, however, there's time to visit the opera and get in their contractually required Phantom references. To Greta's surprise, while there's no ghostly apparition in Box 5, there is a creepy vampire in need of a haircut staring at her from another of the theatre's boxes. Said vampire quickly makes his terrible aesthetic and coven management skills - and his vendetta against Ruthven - into Greta's problem by abducting her to his lair in the conveniently atmospheric catacombs of Paris, where she comes into contact with the rest of his terribly-dressed coven and the mess they have made of 1) the city, 2) themselves and 3) the fabric of reality. The coven, their politics, and the weird pet-creatures one of them keeps summoning through a rift in reality, are the highlight of Dreadful Company, which is for the most part a pretty claustrophobic narrative. Corvin, the coven leader, hits just the right blend of absurd and dangerous. His obsession with image, and with a particular type of stereotyped "vampiriness", gives Shaw lots of material to poke fun at particular aspects of the vampire myth, but at the same time the narrative is very clear that this isn't what makes him villainous: rather, its one symptom of his toxic fixation on power and control. Corvin's weary second-in-command, Grisaille, perhaps gets a more sympathetic ride in the book than I'd like, but he makes an interesting foil to Corvin's excesses. Greta's predicament, and the wider happenings in Paris, also pull in some other members of the supernatural community, including werewolf Alceste St. Germain, and "remedial psychopomps" Dammerung and Brightside, whose job is to seek ghosts who missed their trip to the afterlife the first time around. On our heroes' side, there's a practical, cooperative air to the inevitable rescue mission that reflects the attitude of Greta herself - she is a medical doctor, after all - and, again, contrasts wonderfully with the behaviour of the coven. Like Seanan McGuire's Incryptid series, Dreadful Company is a book where monsters are just people, and one of the underlying messages here is that healthy personal identities shouldn't be constructed from mystery and ego, even if you are an ageless vampire. Unfortunately, I found Dreadful Company to be a book where my opinions on the aspects that fell short are unusually strong, despite how much I appreciated it overall. Some of those annoyances are pretty specific - for example, my initial excitement at learning Hell has a Monitoring and Evaluation department (my job! in a book!) didn't survive the descriptions of what that bureaucracy looked like in Shaw's world. I'm also tired of authors taking side swipes at "sparkly vampires": Twilight's vampire physiology was never an accepted feature of the genre, and that means its not a trope that needs deconstructing; rather, it's an innovation of a single problematic-but-successful female author whose work is now open to unquestioning mockery. It frustrates me that modern YA vampire tropes aren't given nearly the same care and critical attention in Dreadful Company as Victorian ones seem to be, and that comes across as a significant oversight in a series that is so focused on what vampire mythology looks like in a 21st century world. I was also disappointed that, like Strange Practice, Dreadful Company is a highly male-dominated novel outside of Greta herself. In the previous book, several women appear briefly in the background as fascinating characters that the narrative is completely uninterested in, particularly Greta's colleagues at her surgery. Dreadful Company moves us to Paris, thwarting any chances of seeing those women again for now, and instead gives us two women in Corbin's vampire coven: Lilith, Corbin's partner, who is introduced to us via a male POV character as highly strung, stupid, shallow and irrational, and is given very little opportunity to prove us wrong before the narrative overtakes her (she's also the aforementioned pet-summoner); and Emily, the youngest vampire, who is also portrayed as out-of-control and useless although, thankfully, given more space to grow. It's also hard to miss the fact that Greta spends over half of this book trapped with Corbin and awaiting rescue - although she's far from passive through this process, or the eventual escape. I know I have high and specific standards when it comes to representation of women in my reading, and there's space for books that focus on interesting male characters, but the Greta Hellsing series has been particularly disappointing in that it feels like it shouldn't be falling short on this front to the extent that it has so far. With that said, I'm aware that I'm passionate about the things I disliked in Dreadful Company precisely because I am so invested in the ways the series is going right. I like Greta, even if she could do with diversifying her adventuring companions occasionally, and the underlying themes of this series are strongly in line with what I want to read in the limited space I have for urban fantasy in my wider SFF diet. I'll be continuing to keep an eye on this series as it comes out, although I will likely be scanning initial reviews and previews of Book 3 quite hard for evidence of more not-men in the narrative driving seat beyond Greta herself. Still, if you want down-to-earth, self aware urban fantasy with an excellent critical eye for horror tropes and transformative, character driven fiction, this is definitely a series to look out for. Bonuses: +1 Surprisingly adorable hair monsters! Penalties: -1 Twilight alone has not made a generation of young women believe vampires sparkle by default; -1 Please can we have some powerful but matter-of-fact ageless supernaturals who aren't dudes in Volume 3? Nerd Coefficient: 7/10, "A mostly enjoyable experience."